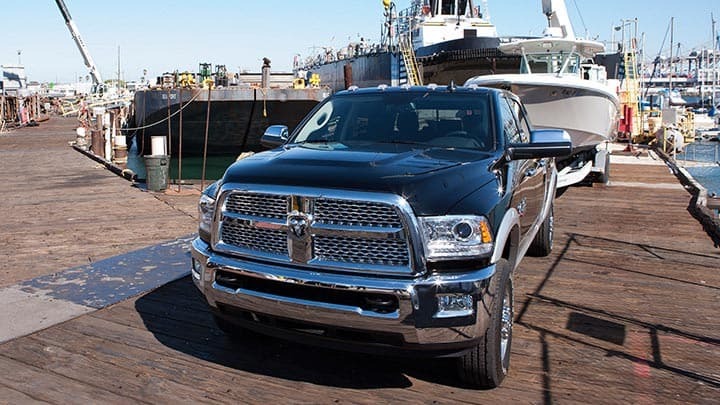 The Ram 2500 and 3500 heavy-duty pickup trucks are available in three cab styles: regular cab, crew cab and Mega Cab. Buyers can choose single or dual rear wheels and one of two cargo-box lengths. The trucks can seat up to six people in certain configurations, and competitors include the Chevrolet Silverado HD, GMC Sierra HD and Ford F-Series Super Duty. The 2500 packs 383-horsepower, 5.7-liter Hemi V-8 engine with 400 pounds-feet of torque, Available 410-hp (370 hp for Mega Cab), 6.4-liter Hemi V-8 with 429 pounds-feet of torque, Six-speed automatic transmission for gas engines, Cummins turbo-diesel 6.7-liter V-8 makes 350 hp and 660 pounds-feet of torque (six-speed manual) or 370 hp and 800 pounds-feet of torque (six-speed automatic) or 385 hp and 865 pounds-feet of torque (3500 with available automatic transmission). The 2500 also features the new coil-spring rear suspension that is standard on every 2014 Ram 2500. The switch from rear leaf springs to coil springs gives the heavy-duty Ram a more civilized feel whether you are pulling a heavy load or driving around with the bed empty. RAM 2500's exterior includes a variety of grille finishes offered, as well as 17-inch wheels; 18- or 20-inch wheels available, Available fog lights, spray-in bedliner, LED taillights, power-folding heated side mirrors, RamBox storage bins in cargo-bed sides, running boards, rain-sensing windshield wipers and a power sunroof. The interior has Vinyl, cloth or leather upholstery, Available heated front and rear seats, ventilated front seatsAir conditioning; dual-zone air conditioning, AM/FM stereo with USB port and MP3 jack, power-adjustable pedals, real wood trim, heated steering wheel, 7-inch screen in instrument panel, 8.4-inch touch-screen, navigation system, and remote start. 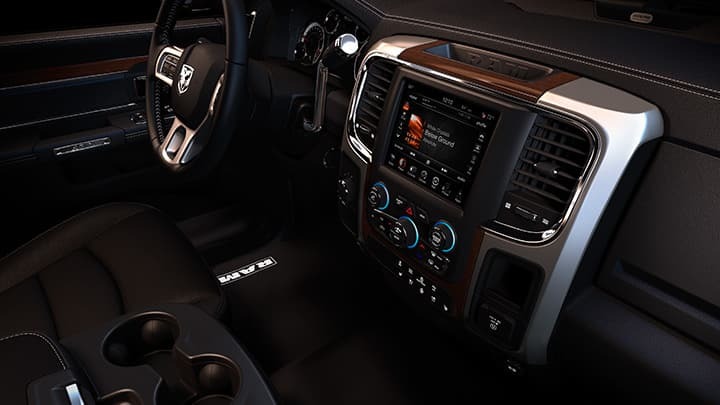 Required in every new RAM 2500 are front airbags, antilock brakes and an electronic stability system. The 2500 also has side-impact airbags for the front seats, side curtain airbags, hill start assist, electronic roll mitigation and trailer-sway control, integrated trailer brake controller, rear parking sensors, and a backup camera. For more information on this vehicle, feel free to give us a call today!